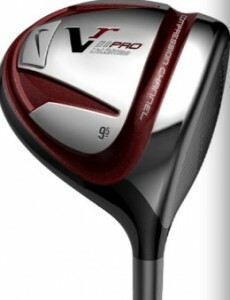 This year, I want the Nike VR Pro Limited Driver (to be released November 2011) . PGA tour players Lucas Glover, Anthony Kim, and Paul Casey have already added this slick beast to their arsenal. This is one of the most beautiful drivers I’ve seen. For this “players” club, Nike has thrown out the ugly STR8-Fit adjustable hosel and glued the shaft directly to the driver head. Nike changed: In addition to throwing out the adjustability, they’ve dialed down the clubhead size to 430cc (from 460cc). Better players who don’t need the extra forgiveness will love how this makes the driver more workable. And smaller doesn’t mean shorter distance. The face is hotter than ever. Nike has added a “NexCor” face. This means they’ve varied the thickness across the face – thinner in the middle, thicker on the sides (heel and toe). The coolest thing to me is the sleek look and color. The smaller pear-shaped driver head painted in dark satin grey is reminiscent of a gorgeous 911 Porsche waiting to be floored. So what do you say Santa? You know I would never throw this driver in the lake. Although, I can’t really speak for my putter -- it’s been giving me some guff lately.